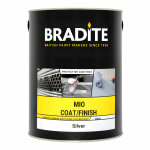 A high build modified alkyd based micaceous iron oxide coating and finish. A high build modified alkyd based micaceous iron oxide coating and finish which gives excellent anticorrosive properties when used as a coating or finish in a conventional protective paint system. It gives good toughness and abrasion resistance. Also good UV resistance due to high micaceous iron oxide content. Particular consideration should be paid to surface preparation, temperature and dryness of substrate. Surface should be dry, clean and to the specified standard. Mixing: all materials should be mixed before use. 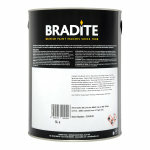 Two pack materials should be comletely mixed before use. Do not mix old or pre-catalysed paints with new stock. The use of a mechanical mixer is always preferred. In case of two-pack materials, take care not to mix more than can be used before the pot-life has expired. Do not apply coatings when the temperature of the substrate is below 3°C above dew point, to avoid surface condensation affecting the coasting as it dries.